Each month, I spotlight two books guaranteed to delight readers and provide fun activities to further extend the meaning of each reading experience. With so many wonderful titles available, this is no easy task! 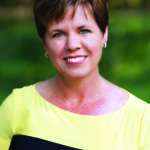 I bring a 33-year teaching career, literacy expertise and a passion for creating joyful readers to every column I write. I certainly hope you enjoy this month’s picks as much as I do. Leaves need sunlight, air, water and chlorophyll to make food (sugar) for the tree. During the spring and summer, leaves serve as factories where most of the food that a tree needs to grow is manufactured. This food-making process takes place in the leaf in numerous cells containing chlorophyll which gives the leaf its green color. In autumn, because of changes in length of daylight and temperature, leaves stop their food-making process to prepare for winter. The chlorophyll breaks down, the green color disappears and the other colors in the leaves (mainly red, yellow, orange and tan) begin to appear. and bark – the tree saves energy by getting rid of the leaves. In addition to the transforming autumn landscape, other changes are taking place in nature. A host of animals scurry about, gathering food for the coming winter in their nests or dens; some storing fat on their bodies. Overhead, some species of birds and butterflies head south to escape the falling temperatures while furry land animals grow thicker coats to keep warm; some even hibernate for the season. Festivals and other activities revolve around the harvesting of the season’s crops: pumpkins for pies and Jack-o-Lanterns; apples for cider and cakes; bales of hay for wagon rides and campfire seating – roasting marshmallows until they are just slightly charred on the outside and gooey in the middle! Award-winning Douglas Florian is the talented poet and artist of this compilation of fanciful poems about all things autumn – falling leaves, ripe apples, cool days, southbound geese, etc. His playfulness with language is sure to delight readers! Invented words (e.g. owlphabet and fallicopters), descriptive spellings (e.g. industree and hi-bear-nation) and changes in fonts and type ensure that reading is a bushel of fun. Florian, who often uses the natural world as the subject for his work, complements his lively poetry with childlike watercolor and colored pencil art to highlight such autumn sightings as a single, reddish-purple apple lying on the sun-kissed ground and a leaf that is as vibrant as a flickering flame. Douglas Florian is a poet for all seasons, but this book is the perfect poetry choice for fall. Do brown bears really hi-bear-nate? Moles and voles in burrows crawl. Do brown bears slum-bear when it’s fall? 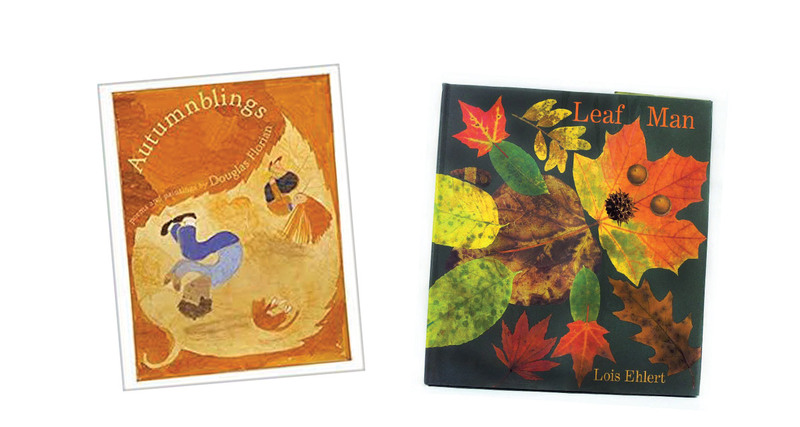 A long-standing favorite children’s book author and illustrator, Lois Ehlert has created a visual autumnal feast for children and adults with fantastic illustrations made almost entirely from leaves. The narrator reminds readers that, “A Leaf Man’s got to go where the wind blows.” As the breeze carries the Leaf Man first eastward and then westward, beautiful fall landscapes come into full view – a field of pumpkins, prairie meadows dotted with cows at harvest time and a marsh filled with geese and ducks. This whimsical tale celebrates the beauty found in nature and the colors of the season. The creative use of bold backgrounds, varying textures and a patchwork effect (a trademark of Ehlert) are the perfect accompaniments to the simplistic storyline of the Leaf Man’s journey. At the end of Leaf Man, readers are encouraged to listen for a “rustle in the leaves”…and perhaps find a Leaf Man of their very own. Ehlert cleverly fashioned the Leaf Man from a single maple leaf and gathered brilliantly colored leaves from oaks, hawthorns, elms, beeches and other trees to create a variety of objects and animals in the book. In like fashion, on a crisp, fall day, put on a jacket and go outside with your family to gather as many interesting and brightly colored leaves as possible. Make leaf-shaped animals and objects – you are only limited by your imagination! Use crayon, chalk, paint, construction paper cutouts or any other medium you like to create a background and glue on your leafy creations. To preserve your work of art, cover it with clear contact paper. Heat oven to 300 degrees F. Spread the seeds on a rimmed baking sheet and bake until totally dry throughout, 50 to 60 minutes. Transfer the seeds to a large bowl (reserve the baking sheet). Increase oven temperature to 350 degrees F.
cinnamon, and toss to coat. Spread the seeds in an even layer on the reserved sheet, and bake, tossing occasionally, until golden brown, 10 to 15 minutes. A bucket list is a number of experiences you want to complete in a given time. See how many of these autumn activities you can accomplish with your family before the season is over (December 21st). Make candy or caramel apples. Collect pinecones and paint them. Go for a walk on a foggy morning. Tell tales by the campfire. Drink a pumpkin spice milkshake. Go through a cornfield maze.